One of the best ways to appreciate an updated vehicle model is to put it side by side with the old model. And here it is. 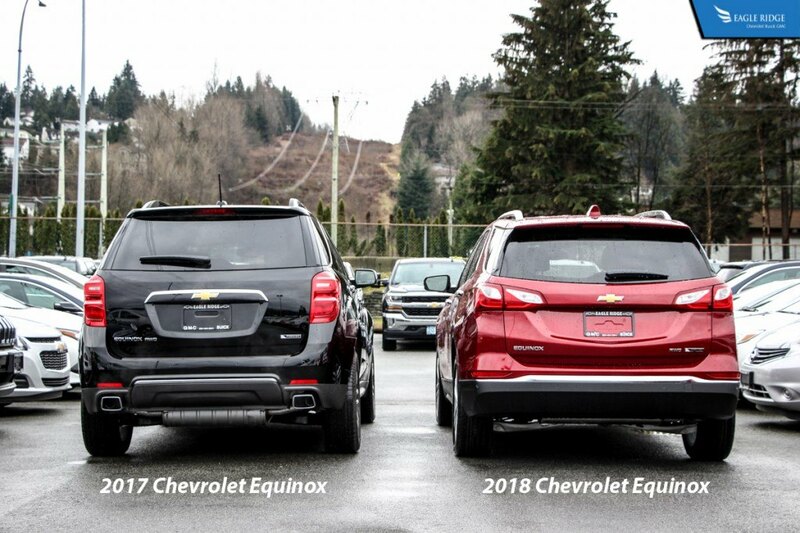 The all-new 2018 Chevrolet Equinox against the old 2017 Chevrolet Equinox. The front fascia now follows the current Chevrolet design language and is similar in style to the 2017 Chevrolet Malibu and 2017 Chevrolet Cruze. The grille is slightly smaller than before and it features Active Grille Shutters which help improve aerodynamic efficiency by closing at higher speeds for better fuel economy. The new headlights feature signature LED daytime running lights with projector low beam lights. 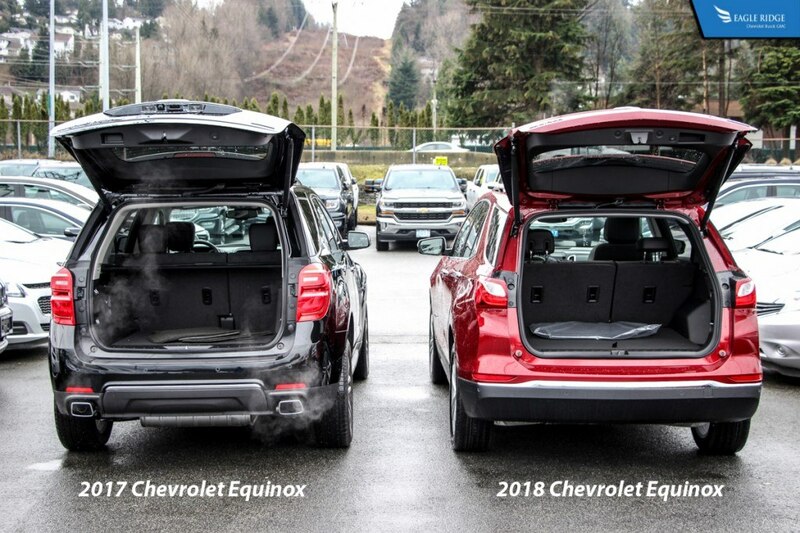 Around to the back, the Equinox looks similar to the Traverse SUV and 2017 Cruze Hatchback. Noticeably absent are the exhaust pipes from the new Equinox. They’re still there but they’re just hidden behind the bumper for a cleaner look. Although the exterior dimensions have shrunk slightly, interior room is actually bigger. This is most noticeable in the trunk which is wider and deeper thanks to storage areas underneath the trunk floor. The 2018 Equinox is now available with a panoramic sunroof which adds to the feeling of openness and space inside the cabin. Sound insulation has also been added throughout the cabin along with Active Sound Control which further reduces unwanted noises from outside the car to intrude inside. The dashboard has been updated and features more upscale materials such as contrast stitching and leather. The design of the dashboard and steering wheel are in line with other new Chevrolet vehicles and features a large 8” touchscreen as the center piece. 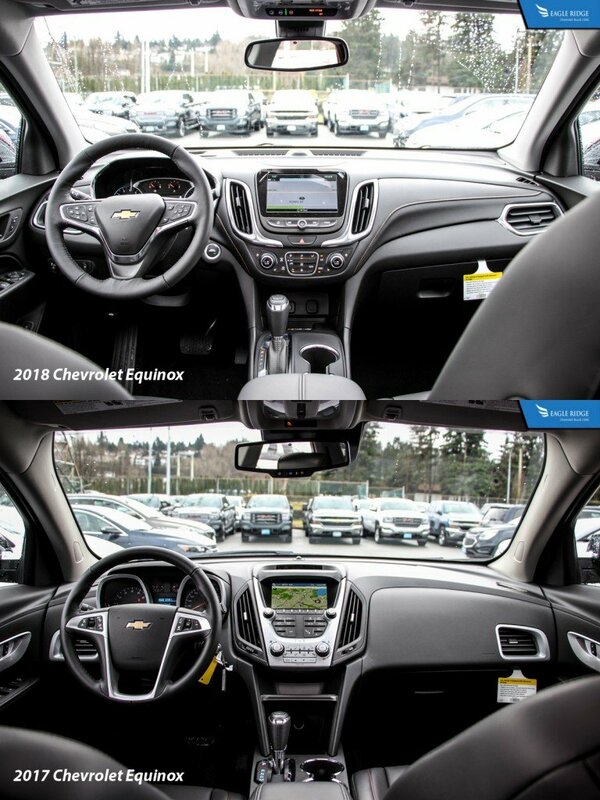 Dual zone climate control, push button start, 360 degree camera system, ventilated seats, Apple CarPlay and Android Auto integration, and auto start/stop features are now available on the 2018 Equinox whereas before they were not. The biggest difference between the old and new is when you look under the hood. The V6 is gone and will no longer be offered. In its place is a range of turbocharged 4 cylinder engines. The base engine is a 1.5L turbo that produces 170hp and 203 lb-ft of torque. The V6 replacement will be a 2.0L turbo 4 cylinder that produces 252hp and 260 lb-ft of torque. But for maximum fuel efficiency, Chevrolet is also going to offer a diesel 1.6L turbocharged 4-cylinder engine that delivers 136 horses and 236 lb-ft of torque with up to 5.9 L/100km of fuel efficiency on a highway. Further improving the fuel efficiency figures is an option (on AWD models) to disable the All-Wheel-Drive system and a new 9-speed automatic transmission. Safety is something that Chevrolet takes very seriously which is why the new Chevrolet Equinox is packed with safety features that are designed to prevent an accident, keep you safe during an accident, and ensure that medical services quickly reach you after an accident. To prevent an accident, the Equinox can be fitted with a host of technology features such as Lane Keep Assist which gently steers the vehicle if it has detected that it is drifting outside of the lane. Forward Collision Alert, Rear Cross Traffic Alert, Side Blind Zone Alert, and a Rear Vision camera further add an umbrella of safety around the Equinox. A new feature for this vehicle is Low Speed Forward Automatic Braking which will automatically brake and stop the vehicle if it detects an imminent collision when travelling below 80 km/h. 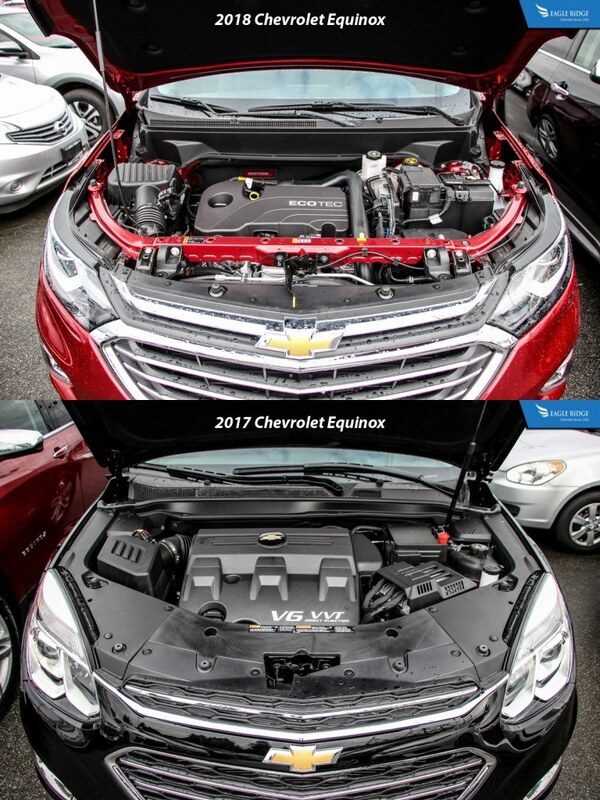 But sometimes an accident is unavoidable in which case the 2018 Equinox is equipped with 10 standard airbags, high strength steel in key location throughout the vehicle to protect the occupants, and an industry-first front center side-impact airbag which deploys to the inboard side of the driver seat to add a layer of protection between driver and passenger. When the vehicle has been in an accident, standard OnStar system will automatically connect you with an OnStar advisor that can pinpoint your location and send emergency help to your exact location. 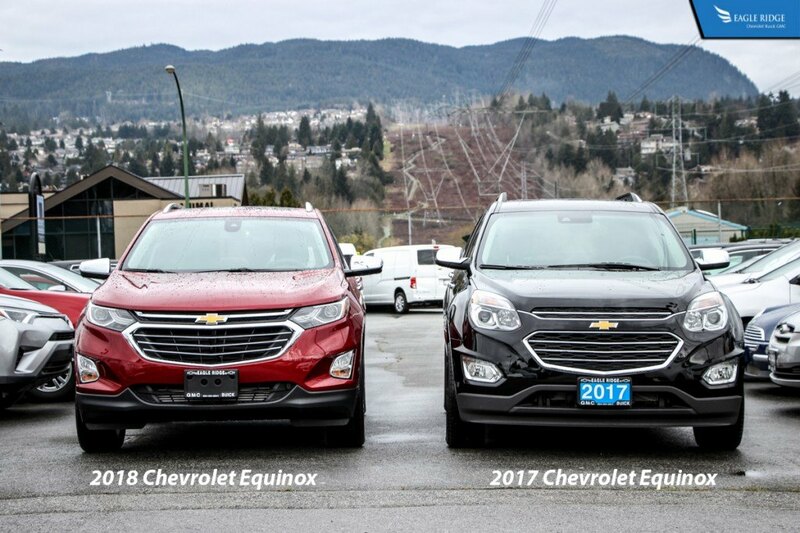 The last generation Equinox was a big step forward for Chevrolet in making a reliable and comfortable SUV but with the 2018 Chevrolet Equinox, it’s aiming higher.